Animal feed headed from the Overberg to farmers in Zastron, courtesy JD Stemmet Vervoer. The vicious El Nino conditions of 2015 have created democratic South Africa’s first truly devastating drought. Not since 1992 has so little rain fallen on the land. Never has our water supply infrastructure been so vulnerable. Parched earth near Aliwal North. Six out of the nine provinces have been declared disaster areas. Just before Christmas, the Director-General of the Department of Water and Sanitation authorised water to be released from Katse Dam in Lesotho after the Orange River stopped flowing at Aliwal North. The heatwaves and unrelentingly blue skies have dam levels dropping by 1% a week, according to Water Department spokesman Sputnik Ratau. In November, the Department called on South Africans to pray for rain. Water quality is also plummeting. In November, the SA Institute for Race Relations published an article on the country’s desperate problems with water quality in its journal, @Liberty. Written by water specialist Professor Anthony Turton of the University of the Free State, it points out that the water shortage is also an ‘induced’ one. The raw sewage is creating blue-green algal blooms, and a substance this ancient algae exudes is called microcystin, a potent toxin that causes cancer as well as damage to the liver and nervous system. But it is the sheer lack of water that has grabbed most of the headlines. The southern Free State town of Smithfield ran out of water completely in November 2015, and the army was called in with water tankers. In December, the tinder-dry veld went up in flames near Zastron, devastating dozens of farms left without grazing for their surviving livestock. Half of the land was communal grazing land for emerging farmers. South Africa’s breadbasket is the Free State – and usually in midsummer you’d see maize and sunflowers stretching to the horizon. Now it is a dustbowl. Fences are disappearing under sand. There is nothing green anywhere, as a shocking drone video taken from Verkeerdevlei toll plaza shows. 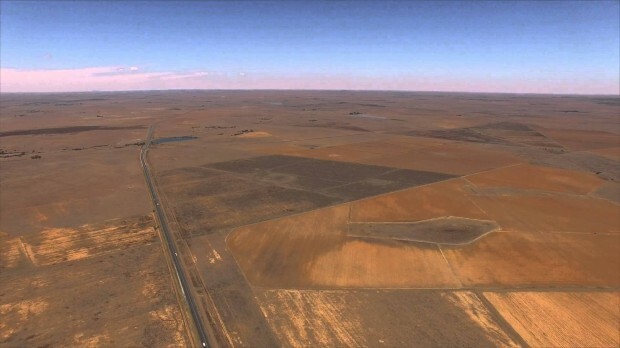 An image taken from a drone near Verkeerdevlei toll gate in the Free State. The drought is slashing the projected harvest of maize and other crops and South Africa will soon have to import – at the precise time that the rand-dollar exchange rate is at its weakest levels in decades. The price of maize has doubled in a year and is expected to increase further. On 28 December 2015, a young farmer, Krisjan Kruger of Elliot in the Eastern Cape, committed suicide in despair over the drought. Into this hot, dry and dusty hell, Drought Angels have appeared. Drought Angels, coordinated by social media, have stepped up to help. A South African Drought Angel is anyone who brings a measure of relief – in the form of bales of feed, diesel for trucks, a contribution to a central aid fund or a bakkie load of bottled water – to those desperately in need everywhere in the droughtlands: township dwellers, farmers and villagers alike. The SA social media landscape is currently buzzing with a new and vast network of calls for help – and the many acts of kindness that follow. World at Large, take note: this is the real South Africa at work. 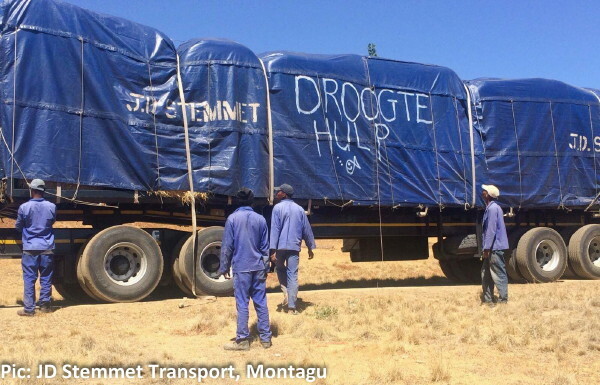 A smallish trucking company called JD Stemmet Vervoer in Montagu, usually occupied with transporting fruit around the Koo region, was contacted by farmers from the Overberg area who wanted to donate lucerne and hay for the desperate Zastron farmers. Within a few days of the fire in late December, JD Stemmet was trucking the badly needed feed across to Zastron – offsetting diesel costs by the transporting grain on the return trip. From the Overberg and Western Cape, with love. Photographs of the trucks, their tarpaulins emblazoned with hearts and the words “Droogte Hulp” went viral on Facebook. 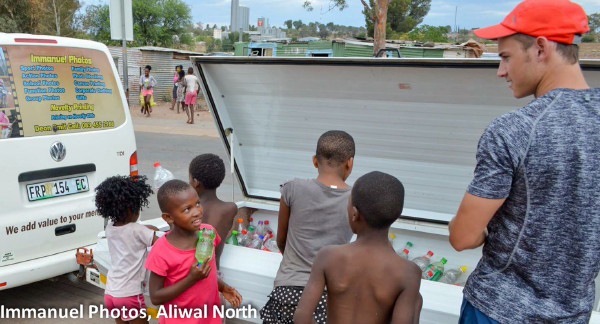 When Aliwal North ran out of water in December, the call went out for people to drop off bottles of water at the town’s Total filling station. 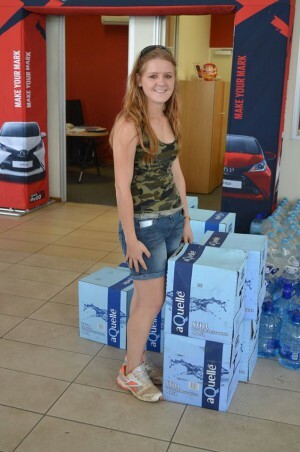 The town of Cradock was one of the first to respond, with a young woman called Corne Mulder Gerber raising money for diesel to transport 800 litres of donated drinking water to the township of Aliwal North. 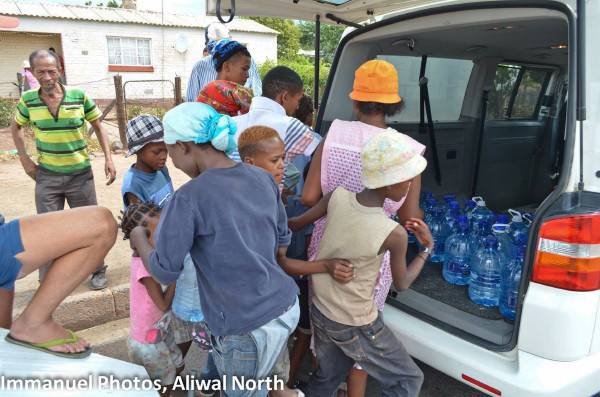 Water from Cradock was distributed in the dry Aliwal North townships. Water released from Katse dam is only expected to reach the town by 6 January 2016. 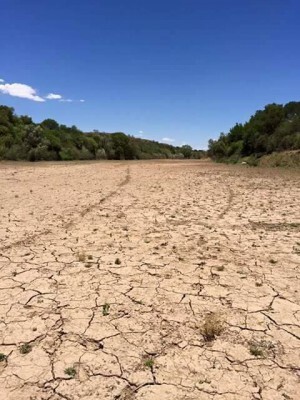 Meanwhile, a Facebook page was recently set up called Water Shortage South Africa, alerting motorists to towns that need water and listing the depots. Apart from Aliwal North, other dry towns include Colesberg, Hoopstad, Bethlehem, Postmasburg, Maclear and Newcastle. Any water donations are welcome, even if the water is more suited for washing and flushing. 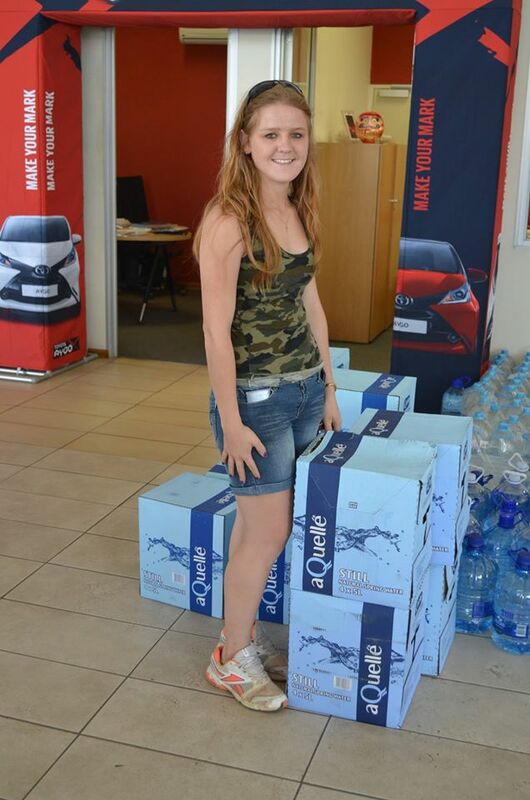 Corne Mulder Gerber – Cradock Drought Angel helping to bring relief to Aliwal North. Image: Deon Smit, Immanuel Photography, Aliwal North. One of the biggest drought outreaches for farmers is being coordinated by an organisation called Boere in Nood/ Farmers in Distress. It was set up in November 2015 by farmers NC Schoombee and Nico Gerber based. Their Facebook page gains thousands of followers every few days. Boere in Nood are linking donations of feed and transportation with farmers who need it. Volunteer Carina Swartz explained that when farmers contacted them, they were asked to fill in an application form. A thousand farmers have already contacted them for help, and Boere in Nood are working on a first-come-first-served basis. The farmers are being sent ten big bales of lucerne or hay each. 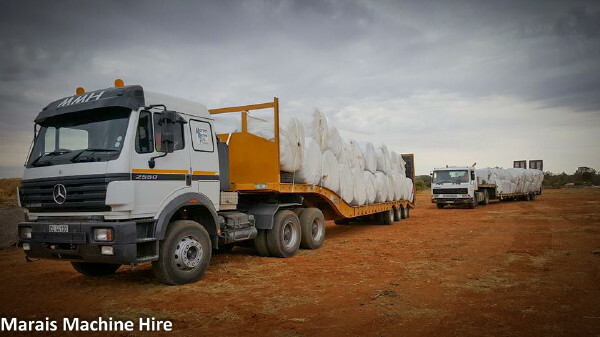 Tielman Marais of Marais Machine Hire is one of those who has donated time and diesel to transporting much-needed feed bales. So far, the southern and western Cape farmers have donated the most feed, with Riversdal communities being particularly generous. The NG Kerk there donated their entire collection on Christmas day to buying 1 000 litres of diesel to help Boere in Nood. Farmers there have also donated many tons of feed. “We use the funds we receive to buy fuel and bales of feed where the donations fall short,” said Carina. Like the five other people at Boere in Nood, she has been working 12 to 15 hour days for the past six and a half weeks, Monday to Sunday. “I go to bed happy, satisfied, knowing I have done something to help people. But I also go to bed scared as hell. Scared we’ll run out of bales, out of funds, that we won’t be able help all the people who need it. To help Boere in Nood, donate money to their First National Bank account number 625 229 860 43, branch code 250 655. Otherwise email them on boereinnood@gmail.com if you have feed you can donate, or if you can help with fuel or transport. Donations from outside the country can be made to a Paypal account – nc.schoombee@gmail.com. Contact Deon Smit of Immanuel Photography on 083 455 2166 if you can help Aliwal North. Find the drop-off points for various towns you might pass through and help with bottles of water via the Water Shortage South Africa facebook page. Agri-SA has started a drought fund. Find out more or donate via http://www.droogterampfonds.co.za. 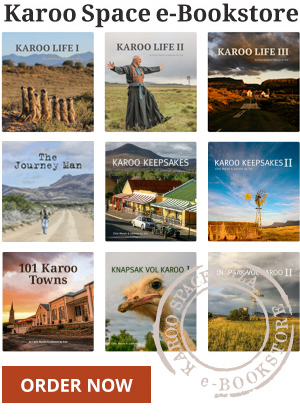 As a proud born Free Stater and someone who loves the Karoo, I would like to thank Karoospace for giving valuable exposure to the efforts of Boere in Nood. Well done, Karoospace! You are making thousands of South African acts of generosity visible to the world. We owe a huge debt of gratitude to the Drought Angels who are putting in so much time, effort and ingenuity. Sometimes we need a good crisis to show us how resilient we can be. We also need to pay much more attention (once the drought crisis is past) to the sewerage crisis highlighted by Anthony Turton. I would welcome ideas on how this can be done. My parents want to donate water to any one that could collect. They are elderly and pensioners, do not have transport but have a lot of water to give. They live in the Randfontein area on the west rand.